Chapel Interior - Video Inside! Administration Building Exterior - Video Inside! Dawson-Loeffler Exterior - Video Inside! Library Exterior - Video Inside! Dance Studio J - Video Inside! Freede Trophy Entry - Video Inside! Kramer Exterior - Video Inside! Meinders School of Business - Video Inside! Info about Gold Star ambassadors. I like this view more than the first photo (from the inside of the glass). If they have a video about Bass, put it here. Info, maybe about people coming from around the world to study here (flags). Info about the pavilion/ events on the pavilion. I like this as a starting point as well. Freede gym Tour from Oklahoma City University on Vimeo. 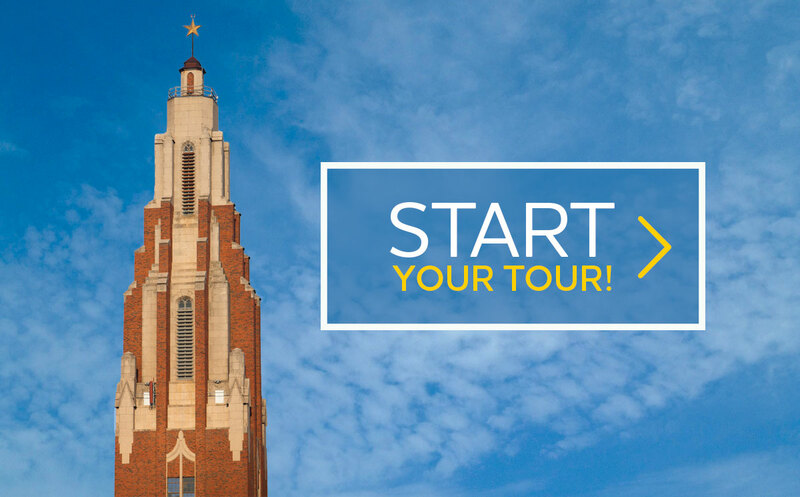 GoldStar Building Tour from Oklahoma City University on Vimeo. Start Here - Show a navigation map with links to scenes in the tour. Hot Spots - View information, photo, and video hotspots embedded in a scene.